Crispus Attucks was not only the first African American to die for the revolution, he was one of the first patriots to give his life for the cause. American blood was shed on American soil. The showdown between the British and the Americans was not simply a war of words. Blood was shed over this clash of ideals. Although large-scale fighting between American minutemen and the British redcoats did not begin until 1775, the 1770 Boston Massacre gave each side a taste of what was to come. No colony was thrilled with the Townshend duties, but nowhere was there greater resentment than in Boston. British officials in Boston feared for their lives. When attempts were made to seize two of John Hancock's trading vessels, Boston was ready to riot. Lord Hillsborough, Parliament's minister on American affairs, finally ordered four regiments to be moved to Boston. This print of Paul Revere's depiction of the Boston Massacre is on display in the Diplomatic Receptions Rooms of the Maine State Department building in Washington, D.C.
Samuel Adams and James Otis did not take this lightly. Less than three weeks prior to the arrival of British troops, Bostonians defiantly, but nervously, assembled in Faneuil Hall. But when the redcoats marched boldly through the town streets on October 1, the only resistance seen was on the facial expressions of the townspeople. The people of Boston had decided to show restraint. The other 12 colonies watched the Boston proceedings with great interest. Perhaps their fears about British tyranny were true. Moderates found it difficult to argue that the Crown was not interested in stripping away American civil liberties by having a standing army stationed in Boston. Throughout the occupation, sentiment shifted further and further away from the London government. On March 5, 1770, the inevitable happened. A mob of about 60 angry townspeople descended upon the guard at the Customs House. When reinforcements were called, the crowd became more unruly, hurling rocks and snowballs at the guard and reinforcements. In the heat of the confusing melee, the British fired without Captain Thomas Preston's command. Imperial bullets took the lives of five men, including Crispus Attucks, a former slave. Others were injured. This party in proceeding from Exchange lane into King street, must pass the sentry posted at the westerly corner of the Custom House, which butts on that lane and fronts on that street. This is needful to be mentioned, as near that spot and in that street the bloody tragedy was acted, and the street actors in it were stationed: their station being but a few feet from the front side of the said Custom House. The outrageous behavior and the threats of the said party occasioned the ringing of the meeting-house bell near the head of King street, which bell ringing quick, as for fire, it presently brought out a number of inhabitants, who being soon sensible of the occasion of it, were naturally led to King street, where the said party had made a stop but a little while before, and where their stopping had drawn together a number of boys, round the sentry at the Custom House. whether the boys mistook the sentry for one of the said party, and thence took occasion to differ with him, or whether he first affronted them, which is affirmed in several depositions,-however that may be, there was much foul language between them, and some of them, in consequence of his pushing at them with his bayonet, threw snowballs at him, which occasioned him to knock hastily at the door of the Custom House. From hence two persons thereupon proceeded immediately to the main-guard, which was posted opposite to the State House, at a small distance, near the head of the said street. The officer on guard was Capt. Preston, who with seven or eight soldiers, with fire-arms and charged bayonets, issued from the guardhouse, and in great haste posted himself and his soldiers in front of the Custom House, near the corner aforesaid. 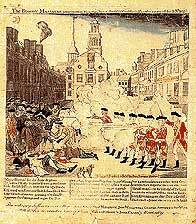 Five men were killed in the incident known as the Boston Massacre. 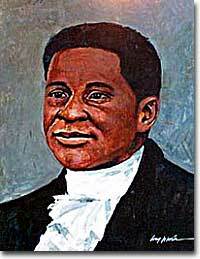 Among them was Crispus Attucks, a former slave. Captain Preston and four of his men were cleared of all charges in the trial that followed. Two others were convicted of manslaughter, but were sentenced to a mere branding of the thumb. The lawyer who represented the British soldiers was none other than patriot John Adams. At the same time Preston's men drew blood in Boston, the Parliament in London decided once again to concede on the issue of taxation. All the Townshend duties were repealed save one, the tax on tea. It proved to another error in judgment on the part of the British. The Massachusetts legislature was reconvened. Despite calls by some to continue the tea boycott until all taxes were repealed, most American colonists resumed importation. The events in Boston from 1768 through 1770 were not soon forgotten. Legal squabbles were one thing, but bloodshed was another. Despite the verdict of the soldiers' trial, Americans did not forget the lesson they had learned from this experience. What was the lesson? Americans learned that the British would use force when necessary to keep the Americans obedient. If it could happen in Boston, where would it happen next? This anonymous account begins, "THE HORRID MASSACRE IN BOSTON," and is followed by a description of the events leading to the Boston Massacre and details the event itself. Well worth a read, it is one of the few firsthand accounts of the massacre that has survived. 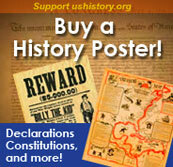 This website, part of a larger site devoted to American history, includes other primary documents from the American Revolution. How does this account by British Captain Thomas Preston differ from the anonymous account? Although privileged white men often receive credit for blazing the trails of revolution, the lower classes suffered the majority of hardships. They included free and enslaved African Americans, as this PBS website explains. 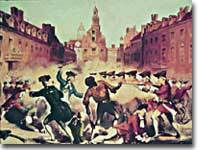 How was this group affected and what role did African Americans play in the American Revolution, specifically the Boston Massacre? Find out at this interactive Africans in America website. From runaway slave to immortalized patriot, read this brief biography of Crispus Attucks. Paul Revere actually entered the spotlight years before his midnight ride when he created an engraving depicting the Boston Massacre. This website from Early America tells the story of Revere's famous engraving and how it was used to gain support against the British. As defense lawyer for the British soldiers and officers responsible for the Boston Massacre, John Adams certainly had his own interpretation of the situation. His summary of the events, from his published legal papers, depicts Crispus Attucks and the other victims as "a motley rabble of saucy boys, negroes and molattoes, Irish teagues and out landish jack tarrs." Ouch! Read what else Adams had to say. On the second anniversary of the Boston Massacre, hundreds of Boston colonists gathered to remember the event and the victims. Dr. Joseph Warren delivered a speech that not only commemorated the event, but also stirred feelings of liberty and revolution for all in attendance. Read the full text of Dr. Warren's speech at this website. Many primary documents of the Revolution Era. How would a student living in 1775 tell the tale of the Boston Massacre? What if the student were Benjamin Franklin's grandson? Historian Claude-Anne Lopez brings the past to life in this historical/fictional diary of William Franklin. This narrative uses real events and draws on real accounts to desribe the events of the American Revolution. Immerse yourself in this unique tale of the Boston Massacre. Read the Monday, March 12, 1770 edition of the Boston Gazette and Country Journal for an account of the massacre.